Figured being Friday, with nothing to do this evening I would add a new weekly feature to T6F called the Starting XI. Original, huh? This will be an overview of my traditional FPL squad, as well as the draft squad before the start of each week. Much of the discussion leading up to kickoff deals with transfer information, as well as a retrospect on what happened the previous week. Sometimes I talk through me team, as I did this week. With Twitter taking over where forums left off, I figure I have some more FPL to offer would be managers. This week begins where last week left off, so to speak. The formation remains a non-standard 5-2-3, while I am not taking advantage in the attacking department, GW1 provided a glimpse of what COULD be if my defenders perform; 6 clean sheets, 1 assist and 3 bonus points for 38 points! Unfortunately GW2 was an indication of what WOULD happen if my So’ton treble give up, not one but 2 goals! They totaled 7 points, Kompany failed me at home for another single digit return but Foster and Valencia came through. Heading into GW3, I had wrote about midweek options, not completely sold on activating my wild card, I had considered the Free Hit Chip, as well as a point hit. After some debate, research and discussion now was not the time to hit. In fact, I was probably a bit premature in pulling the trigger to move KDB in favor of Eriksen, as City are away to Bournemouth (15 goals and 1 against in the last 4 matches against the Cherries). Yet, Eriksen is a hot commodity and I wanted to get in on the price increase, so I finalized the transfer on Monday night. With the transfer out of the way, I was pleased with the look and feel of my 5-2-3. 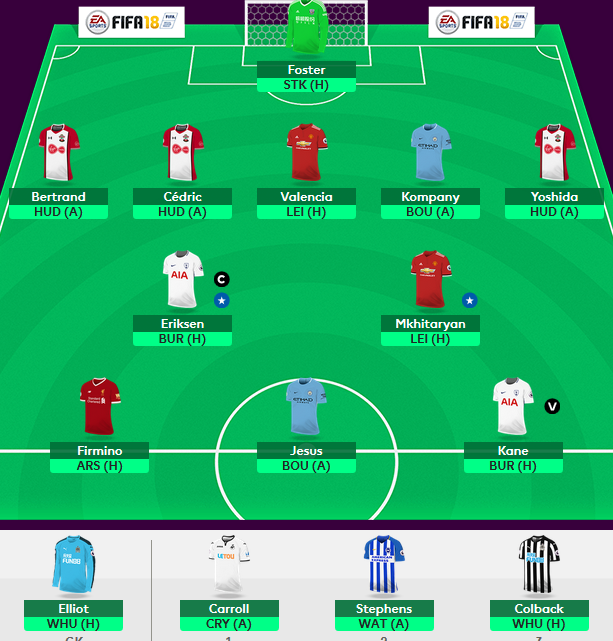 While I am still positive, 96 points and a 2.2m overall ranking don’t sit very well, but I wasn’t the only manager to struggle in GW2. Again, it was a lack of attacking returns that caused despair. Heading into GW3, with a Spurs double (Eriksen & Kane) home to Burnley, I feel confident big returns are possible from Wembley. I am also doubled up on Man United, yet I am still without Lukaku, as I figured I could see bigger returns from the duo of Firmino and Jesus than “Big Rom.” So far, it hasn’t really paid off. After going down to 10-men, Jesus was “unfairly” substituted and KDB played more defensive, which could account for the lack of attacking returns. I don’t expect a lack of points this week from Jesus and expect Pep to play him 75+ minutes! Mkhitaryan is my sole attacking options from United, unless you consider Valencia in the mix, unfortunately his average positioning hasn’t been as attack as I would like to see. Thanks to Jose playing 4 at the back, he has been limited in his journeys forward. Valencia and Kompany are the back end, doubling up on United and City. While I am a big Kompany fan, his matches could be numbered in favor of Alonso. As for Valencia, with £1.0m ITB, this could be a potential FT in the upcoming game weeks. However, uncertainty surrounds the treble So’ton defense. On paper the fixtures looks great; hud/WAT/cry/MNU/sto/NEW/WBA/bha/BUR. Outside of United, these all look to be great options for clean sheets. Realistically, we know that won’t happen. Just look back at GW2 and conceding 2 goals to a 10-man West Ham! Frustration! While we can quote stats and speculate all we want, we don’t know how it will play out. I do believe my team is good for 80+ points this weekend. The defenders have the possibility to reproduce their GW1 magic with 6 CS, while all the attacking options should return. With the inaugural FPL Draft season underway, I am not impressed with the format. It reminds me too much of fantasy (NFL) football, a game I have spent 37 years playing and I am just tired of the format. Yet, being new and staying open-minded I jumped in a community league and was present for the draft. 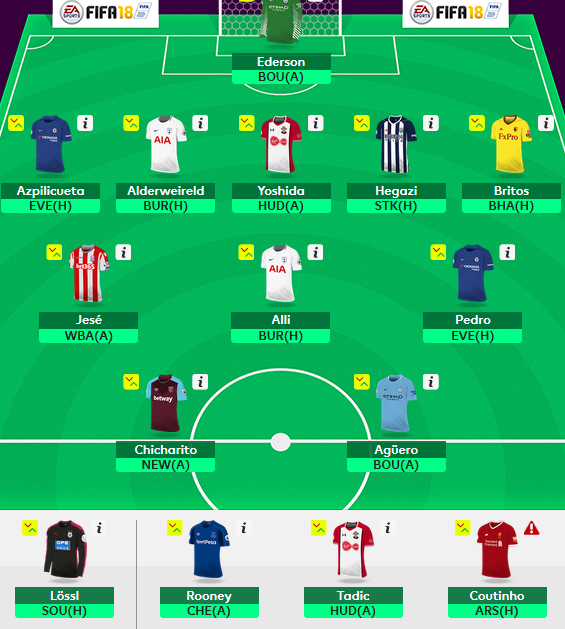 With half the managers on ‘auto draft’ I feel I made out with a strong 15-man squad. While I won’t bore you with details from the first two game weeks, I scored 56 points and 24 points respectively. A total score of 80 puts me solidly in 3rd place, 15 points off 2nd place and 29 points from the top. This without my 2nd round selection, Coutinho. His Liverpool future is still up in the air, but after management turned down a huge Barca offer, it could be remaining at The Kop. This week I look to rebound from a poor GW2, with the 5th best weekly score in the league it was time to hit the free agency trail. This week I made 5 transfers, three of which were waiver claims and two FA acquisitions this morning. Looking to shore up a questionable attack, I was surprised the Chicharito was still available, facing a struggling Newcastle away could mean good things for the Mexican. It cost me Defoe, but the Cherries are struggling. With Pedro now fit, playing last week, I inserted him into the starting XI, pushed Tadic to the bench. The bench is where Rooney resides as well, not a fan, away to Chelsea, but I am finding it difficult to drop him, if I want to play a 3-4-3 or 3-5-2 in the future. The other offensive player that was still a FA, Jese. With just a single match under his belt for Stoke and a goal, I snatched him up for Brady (BUR). Jese, once match fit should be well worth the acquisition. Defensively I made three changes this week introducing Lössl for Begovic, Hegazi for Danilo and Britos for Daniels. Danilo was a question mark with a favorable fixture away to Bournemouth, but with Mendy nearly fit, rotation could begin. Hegazi has been the surprise defender for WBA this season on the back of a goal and 2 CS. Britos was a bit of a punt this week, but Marco Silva has the Hornets in 4th, playing some good footy. While he won’t be an every week player, I look for a good, solid return in GW3. Core players I started the season with defensively include Azpilicueta and Alderweireld, as Yoshida was introduced for GW2. Ederson for City remains my main shot stopper but the addition of Lössl could see a rotation based on fixture and SoS. Joining Jese and Pedro in the midfield this week is Alli. Drafted in the third round, Alli could be in contention for the top scoring midfielder this season, based on his statistics from last season. While I would love to couple him with Coutinho, we must play the waiting game until the window closes on transfers, however I could see him returning to the Liverpool starting XI in September. Up front with Defoe now gone and the “Little Pea” plays second fiddle to Kun Aguero but feel I have a well rounded starting XI that should challenge for the top spot in my 8-team league. Expectations this weekend are high, as they were with my traditional squad. Defensively, I have the possibility of running the table with clean sheets, but feel Chelsea might concede one to Everton. On the attacking end of the pitch, 36 points isn’t a stretch based on the fixtures this weekend. At any rate I just hope to make up ground and move up in the overall standings.